You don’t have to wander very far to know how challenging that can be. 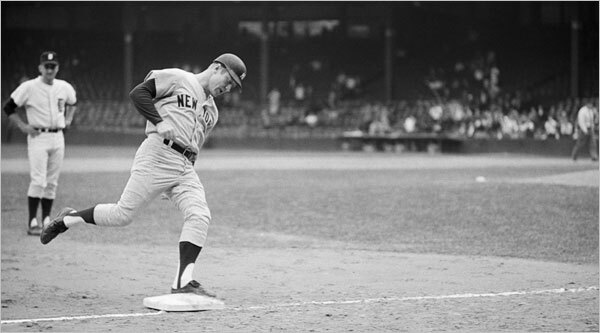 Mickey Mantle long regretted how it ended for him, a 1968 season in which he could barely walk, in which he hit .237 and knocked four points off his career average, leaving him at .298. And Mick hit .237 that year, which didn’t make it any better. Mantle wished he hadn’t suited up for the 1968 season — Yankees management had talked him out of retiring — but the 37-year-old still managed to appear in all but ten games, matching or exceeding his attendance record from the previous six years. Heck, he stole six bases in eight tries, pretty impressive for a guy we’ve been led to believe was playing with two amputated legs. Sure, he may have posted a career low batting average in 1968 but it was by no means a precipitous drop from his penultimate season (.245). Mantle was the most productive Yankee on the 1968 roster. Only Roy White’s 137 OPS+ was in the neighborhood of his 143. If you’re wondering why his OPS+ in his final campaign is virtually identical to his perfectly cromulent 1953 season, note that 1968 is known to historians as the notorious “Year of the Pitcher.” Seven starters posted ERAs below 2.00. The AL batting champ was Carl Yastrzemski, the previous season’s Triple Crown winner, who hit .301. And yet, Mantle’s on-base percentage was a robust .385, second in the Junior Circuit to Yaz’s .426 and fourth-best overall. Okay, I’m not naïve: Mantle didn’t look like Mantle in 1968. He limped, not quite the image a celebrity who enjoyed the limelight wanted to show off. This was the second year that he was anchored at first base and not patrolling the more familiar outfield. He wasn’t hitting for much power. And yet The Mick remained an asset to his ball club, not an appendage. Suggesting otherwise by focusing on his batting average, a terribly flawed statistic, does his memory a disservice.